Enjoy a desk treadmill combo that can handle heavy walking sessions and users of nearly all heights. The LifeSpan TR1200-DT7 Treadmill Desk bundle features padded armrests, personal item shelf, integral cable management, and a built-in digital control panel to keep you working in comfort. This revolutionary treadmill desk provides a safe, stable walking experience due to its wide walking surface with six compression shocks and LifeSpan's Intell-Guard technology to support you in every step. This revolutionary treadmill desk provides a safe, stable walking experience due to its wide walking surface with six compression shocks and LifeSpan's Intell-Guard technology to support you in every step. Choose either a 38'' wide or 48'' wide desktop for your treadmill desk. 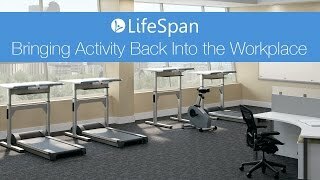 The LifeSpan DT7 Treadmill Desk comes in your choice of four desktop colors: Cool gray, Absolute Acajou, Hardrock Maple, or Wild Cherry. The UPLIFT Treadmill Mat is a must-have accessory for your LifeSpan treadmill. The mat will help prevent dust and dirt from getting into the machinery of your treadmill, keeping your equipment safe. It helps to absorb impact, reduce vibrations, and protect your floor, and the textured, non-slip surface is easy to clean. The UPLIFT Treadmill Mat puts the finishing touch on your treadmill desk set-up. $2,199.00 List Price: $2,499.99* The list price is the same as the MSRP (Manufacturer's Suggested Retail Price). It may not necessarily be the price at which the product is sold.